The rivalry between Chicago and Green Bay rose to a new level after a south suburban Bears fan used a Taser on his Packers fan wife when she “lost a bet" following the Bears win Monday, according to police. John M. Grant, 42, of Tinley Park, and his wife, watched the Bears beat the Packers Monday at Sidelines Tap in Mayville, Wis., where he told police he and his wife made a bet that he could use a Taser on her if the Bears won, according to a criminal complaint filed in Dodge County, Wis.
Grant's wife claims her husband used the Taser “two times on her buttocks” while the two were in an alley smoking cigarettes outside of the bar. "Hell ya it hurt," she said, according to police. 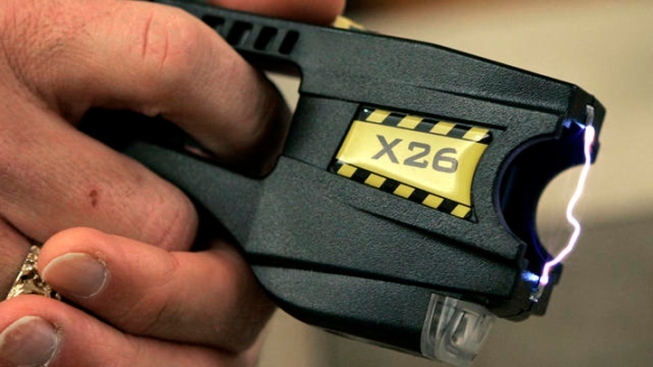 The report states the wife claims she did not give consent for anyone to use a Taser, but cell phone footage of the incident shows her "laughing and it seemed apparent that Ms. Grant had consented," the arresting officer wrote in the complaint. Grant was charged with felony possession of an electronic weapon.